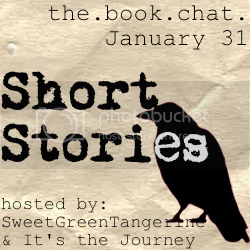 This week, the book chat co-host is the awesome Erinn of It's the Journey. Erinn is a fellow military spouse and book lover. She has a bold and honest quality to her blog that I adore. The first post I read by her, she was standing on a toilet, and I knew right away she was going to be awesome and hilarious. For some reason, I have always dreaded the short story. It's probably from being spoon-fed so many in school, but I just never thought of reading them on my own. I think we can all relate to the school assigned Poe and Hawthorne stories, like The Tell-Tale Heart, Rappacini's Daughter, and Young Goodman Brown. Yeah, the short stories of our history certainly have their benefit. And any Reader's Digest subscriber will admit to loving them, I'm sure. I just can't get into a story that fast. And on top of that, my own assignment is only 300 words. 300 words! That's shorter than most blog posts. And for the record, I'm dreading it, but I'm not nervous about it. I thought I would be nervous, writing (and sharing) my creative writing for the first time. Elementary school poems don't count. But so far, the class has gone fairly well. I received my first constructive criticism and a B last week, which may have warranted a few tears, but I learned what I could and moved on. The important thing is that I'm enjoying it, and I'm learning. So, I haven't written the story yet, and I'm honestly clueless at this point what it will even be about. Whether or not I share it, depends on how well I think it turns out. I know it's not a big deal, and many of you have probably had to do it before, but it's a big deal to me. It finally means a step in the right direction. Okay, I can't not mention at least one short story I love (I guess it's actually a novella). This is a great example of a big message getting across in a small space. You can find a mountain's worth of other works written about this novella and how it was the landmark of early feminism, but honestly, I just loved it. It was the first time I could really relate to a woman of historic literature. I didn't always like her, and I don't necessarily agree with her, but she still got to me. I have read it at least three times and I gain something different every time. If you're a woman who has ever struggled with what it means to be a woman, you need to read this. What are your favorite short stories/novellas? Have you ever written a short story? Grab a cup of coffee and come book chat with us!! Next week's topic: Re-reading. Do you like re-reading your favorites? What book have you read the most? Don't forget to enter my giveaway to win this great book! I dreaded that part of a class! I love to read but actually writing a story paralyzed me. Good luck! I'm going to check out The Awakening. Your recommendation sounds like something I would love. I like when I can reread a story and get something new out of it each time. I have never liked short stories. I avoid them lol. I just feel like they are too SHORT. It ends too quickly. I like to read a book and settle into it not open it and finish it quickly. The Awakening is one of my favorites. I recommended it to people for a while but got a lot of "this sounds really depressing" excuses in return. It so beautiful though. I read The Awakening in my feminist literature class, I absolutely loved it. It gave me a different perspective on what it means to be a mother. When I didn't know what to write about for this book chat, The Awakening was the first recommendation I found online. Now I'll definitely have to check it out!